This handsome bold tungsten carbide"Forever" or "Infinity" ring is 8mm in width. It is high polished with laser infinity design all along the outside to show the never ending bond of you and your partner, friendship or special occasion. A: This ring has a bright, polished tungsten finish. Was this answer helpful? 47 of 51 Customer(s) found this Answer helpful. Q: Is the overall color of this ring silver? Yes, this ring is all around a silver color. The picture makes this photo almost look dark/black, but it is just at bright at the other tungsten rings we carry. Was this answer helpful? 32 of 34 Customer(s) found this Answer helpful. The design is laser engraved, so you will not have to worry about polishing it off. You can use any jewelry cleaner on all of our tungsten rings and they will work just fine. If you have any other questions, please let us know. Thank you! Was this answer helpful? 21 of 23 Customer(s) found this Answer helpful. A: This ring is NOT Black. It it a bright polished tungsten ring. 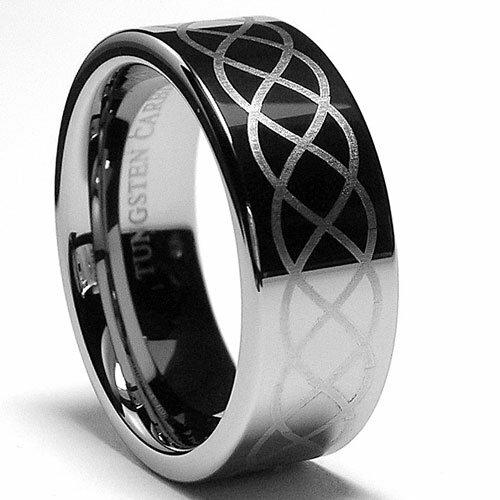 Q: Is it possible to have the Infinity etching applied to one of your Black Tungsten rings? My wife and I would like to get them to exchange on our 20th anniversary next year but she is partial to the black finish? A: Yes of course. Just call us to have this specially done for you! A: We have a ring size conversion chart on our site that you can use for this or you can go to a local store. Hope this helps! Q: Is it possible to get this ring in black, with the etching too? Q: Are the rings made in America? Normally those rings are 400 dollars or more why so cheap? Q: does that ring come without the black? A: These rings are silver and are NOT black. Hope that helps! A: Acid or any other liquid that is corrosive will not affect the etching because it is laser engraved into the ring. If you need anything at all, please let us know! Thank you, TF! A: You can use any cleaner and the etching will not be damaged or removed. The symbol on this ring is laser engraved, so no need to worry! Thank You TF! Q: My ring finger is 3" in diameter measured snug but not tight. What is my ring size? A: You would be about a size 15. You should go to a local store to get sized for the exact size. Thank you! A: The etching is lasered into the ring, you can not scratch or damage it. Hope this helps! Thank you, TF! Q: Can the design on the ring come in gold instead of silver? Thank you. Currently we only have the design in the silver color as shown. Q: Does this ring have black all the way around the ring or just the top portion? Q: Is this ring 2 tone color....it look like its black and silver? Great looking ring. Very polished look to it. There's no black whatsoever like the picture makes it appear. The ring is everything we were expecting it to be and more! We will definitely be getting the women's version of this ring as well. Just amazing quality and fast shipping! I love this ring, I like the way it is comfortable, I can wear it all day and not even realize I am wearing it. I normally never, ever wear rings at all, I'm too hard on them. I have flattened my Original Wedding Band, so far this ring has worn well, I know that some time in the Future I'll see how it handles the Abuse. Thank You Again. IF MY SECOND RING IS AS GREAT AS THIS ONE YOU WILL NOT HEAR ANYTHING NEGATIVE FROM. GREAT BUY. BUT, I THOUGHT IT WOULD BE BLACK NOT SILVER. Very happy with my purchase of the Odyssey Infinity ring. Lots of nice compliments and being asked where I purchased it. I told them Tungsten Fashions. Would not be surprised if some of my pool shooting friends may have already ordered from you. Will definitely consider future orders from you. The Odyssey Infinity Tungsten 8mm Ring is a very beautiful nice weight smooth ring and feels very nice on the finger! First off, the website is so easy to navigate and the service behind it is impressive. I did have an issue (of my own doing) that before I could contact them about, they had already contacted me to make sure my order was indeed what I wanted. Second, they processed my correct order and I received it in 2 days, again impressive. Third, the rings were exactly as advertised and I am completely satisfied. I like the ring but the way it is pictured it appears to be mostly black and it is not so the picture is a bit deceiving other than that shipping was very fast and sizing was good. Bought this ring for my husband. Wanted to give it to him for our 39th anniversary (July 17). But due to an email coming to our home computer he found out about it before the 17th. Good thing though because it is to large. Will have to return for a smaller size. He liked it so much he now wants me to order one for myself so we will have matching bands. It is heavier than I thought it would be, but it is a good quality ring I hope we get many years wear out of them. The price the ring are great I will be back to buy more !!!!!!!! The ring shipped very fast and was true to size! We printed the ring sizer and I thought my boyfriend was a 9 and he thought he was a 10. The 10 was too big (as expected) and we were able to get a 9.5 shipped right away, and it fit perfectly! I love the design and the ring is very sturdy. I love it. This is the first time my wife and I have had matching rings since being married. If an when we by any other rings they will come fro Oddssey. Looks great, exactly what I wanted!! Excellent quality at an excellent price!!! Second time doing business and just as pleasant as the first time, great company! Was just what I expected. I.ave several tungsten rings and this one will be one of my favorites for sure. Amazing quality for the price. Great value. This is the second purchase I have made. First one I lost working in my garden because 11 was big and 10 was small thanks for going to half sizes.